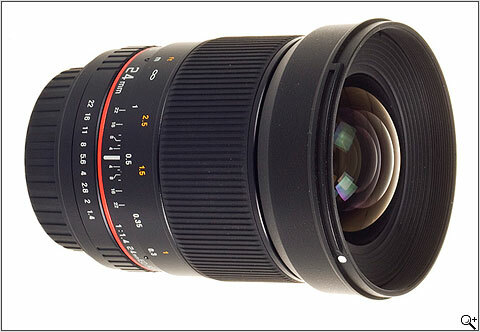 Samyang Optics has announced a 24mm F1.4 lens in Canon, Nikon, Pentax, Samsung NX, Sony Alpha and Four-thirds mounts. This manual focus lens, with its large f1.4 aperture, is made up of 13 elements in 12 groups including 4 low-dispersion elements (ED). The lens is likely to start shipping by the end of this year at a price to be confirmed. Krakow 12.08.2011: Delta Company, the sole distributor of the Samyang brand for Europe, is proud to inform about the upcoming release of the new Samyang lens 24mm f/1.4 ED AS UMC. Optics of the lens has been constructed based on the system of 13 lenses arranged in 12 groups. It should be noted that 4 lenses has been made of the low-dispersion glass (ED), while two another are aspheric lenses. We have also employed multi-layered and anti-reflexive coatings of UMC type adding to the perfect light transmission. Samyang 24 mm F1.4 ED AS UMC has been designed to work with most popular reflex cameras produced by renown manufacturers and equipped with small-image sensors or smaller. The lens will be available with a mount for the following systems: Canon, Four Thirds, Nikon AE, Pentax, Samsung NX and Sony Alpha. 24mm focus is tailor-made for most of the sensors available on the market today. In the case of full-frame cameras, it constitutes a high-quality wide-angle lens perfect for street, landscape and architecture shooting. Whereas photographers using DX sensors will get just perfect lens for the purposes of calmer journalist and landscape photography. 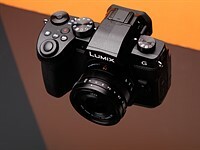 The lens attached to Four Thirds cameras will create a universal and bright construction corresponding to the 50mm focus. The lens should be available for sale by the end of the year or at the beginning of 2012. The exact price will be announced at a later date. Soon, we will be able to present sample photos taken with this sophisticated device. My Rokinon 35/1.4 is excellent. I'll wait on buying the Nikon 24/1.4G until I see how good this Samyang(rokinon) is. Who needs AF ? I have taking pictures for 15 years whit Hasselblad.On a tripod whit mirror lock up and shutter release they are the best pictures i have ever took. I hope they gonna build a 50mm f 1.0 and a 135mm F 1.4.They can do it for a normal price ,or a 200mm f 1.8. If they do that ,i am gonna buy them the same day all 3 off them. I can't wait to slap this on my D7000 for "calmer journalist and landscape photography". Joking aside, should be awesome - I want a fast ~35mm for my D7k and I think this will fit the bill. Looks a bit heavy and big though. Woud've been interested a few months ago, but with Leica announcing its 25mm f/1.4 for the M4/3 (MFT) mount, I'm going with that. They (Leica) even priced it relatively affordably at $1200. guys, can you please at least read the pressrelease before posting questions? samyang makes manual focus primes, thats it! for me personally this lens is physically do big for a 24 prime, but of course this comes with the speed of the lens, i own the nikon 20 2.8 and 24 2.8, so i guess i will not give it a try unless its super low distortion, which for me counts more than sharpness. i had the 85 1.4 from samyang and it was extremely nice! This will make a perfect video lens on a crop sensor. Really looking forward to its release (hopefully at a reasonable price). I don't think their lens were made for your kind of work then. Not worrying about AF lets them make simple optical designs that are cheaper (and sharper) and work on any camera mount. I would not expect to see AF lenses ever. Good to see other brands of lenses. Canon need to pull their finger out. Uh, Canon is already on their second 24mm f1.4 and that came out a while ago. Looking at the picture of the lens, I see an analog depth of field scale normally used on the old film camera manual focus lenses. Is this lens auto-focus or manual? But they are very good opticaly and mecanicaly at a very low price! you could at least read the the first two sentences. That means it'll have worse vignetting and corner sharpness than their 35/1.4 (which has zero issues across the crop frame). But it looks smaller, which could be good. Third paragraph of the press release. I was reading into the sentence "Samyang 24 mm F1.4 ED AS UMC has been designed to work with most popular reflex cameras produced by renown manufacturers and equipped with small-image sensors or smaller" too much. Anyway, I realized that later. On another site they gave the angle-of-view specifications, and it included fullframe numbers. If it comes in at the 35mm price, I'll be picking one up. Why not have auto focus? Because Canon and Nikon doesn't play fair, and doesn't share their AF system specs. Companies like Sigma, Tamron, Tokina has to reverse engineer AF system, thats why they often have AF issues. Maybe one day Samyang will reverse engineer the AF system as well. is it as sharp as canon L series lens, nice option here thou. 1.4 is very nice will the price be as nice? 50/1.2 or faster would be pretty fun. As long as its as good or better than the 1.2's from ~30 years ago. I have been eying the canon 24 1.4II. of this lens is priced around 450, and has the performance of the 35 1.4, and 14 2.8, I would certainly purchase it. This is exactly the lens I've been waiting for. Great for video in a crop format camera like my Canon 60D. You think Samyang sells even 1/100 of what Canon or Nikon sells in a year? Unlikely. The big companies satisfy the vast majority and thankfully there are some niche players to fill in the small gaps. But most would still rather get a slightly slower AF lens from their main brands. My thinking was that 35/1.8 is the sales champion. D700 and the other full frames are still very unpopular niche seriously overpriced products. Why bother buying the vastly expensive full frame lenses when there are cheaper and not so bad crop/DX lenses. I do agree thought that Samyang probably sells 10 to 100 times less lenses than nikon or canon in a year. 35/1.4, 85/1.4 are niche products too. 24/1.4 is actually beyond this it is obscure product. Think how many 85/1.8 or 50/1.8 or 50/1.4 or 18-55s or 17-50 lens are out there and now think if the ultra bright manual focus quite humongous lens sell all that well. I would expect a price around $1000. It is a 24mm f/1.4 and the 35mm f/1.4 sells for $500. 24mm is more complicated to make. The difference between the Nikon 24 and 35mm f/1.4 is by about a factor of two (about $2200 vs $1200 retail). The 35mm has superb image quality. If this follows the same pattern I am sure it will be a good value lens. And to add, on my Nikon I can use any of the focus points for confirmation with my chipped 35mm f/1.4 by Samyang (the AE version for Nikon). Pentax also works fine for focus confirmation. Not sure if it will work for Canon that way or not. For Sony Zeiss it is $1300 and 1200, but the 24mm is f2. So I don't agree with factor of 2. Maybe 1.25 at most. It won't auto focus but it will have focus confirmation. Focus confirmation is a feature of your camera not the lens. See your camera's user manual for 'focus indicator'. I have a 50 years old lens that my D700 still confirm focus with it, even though it's a manual focusing lens. Sorry, I was looking at the wrong 35mm f/1.4 (the old version, not the G). So you are right, $1800 vs $2200 so probably $700 or so for a Chipped Nikon version. Still waiting on the big two to jump in the bandwagon. Putting a 4/3 mount on this lens seems a bit silly. Why a big, heavy, complex and expensive "normal" lens on a 4/3 camera? An f 1.4 24 mm lens for 4/3 can be simpler, lighter, less expensive and perform just as well. Because they already put it all the work to make it big for Canon and Nikon FF. So making it available for 4/3 and anything else is just a matter of slapping a new mount on the back. Next to zero cost. Making a specialized lens for 4/3 would require lots more R+D. Buying an SLR version and an adapter probably makes more sense for owners of mirrorless cameras. Resale value, flexibility. The 35mm f1.4 is about $500 so I would say that's in the same ballpark. I shoot at ƒ8. Why are camera lense makers so obsessed with these high priced fast lenses? I need performance, if I want more speed I'll jack the ISO. "small-image sensors or smaller" WTF does that mean???? Because not everyone has the luxury of shooting f/8 all the time. You ever shoot in anything but bright daylight? Inside of an old church during the ceremony of a wedding? Ever want shallow depth of field? I agree. With so many good large-format sensors out there, do we really need f/1.4 any more? I'd rather have lower-priced good lenses than higher priced fast lenses. The good slow lenses are generally zooms. Think Nikon's 16-85. The image quality is very good. What reason is there to buy most primes other than speed/distortion? These lenses are cheap. The Canon 24L is $1800. This will likely be under $500. Nobody wants to spend money on an F8 prime because many zooms are just as sharp at that aperture. Rob, FF sensors still have a limit on how high you can crank the ISO, in low light having extra stops of light is always nicer. Besides, why shoot at ISO3200 when you can open up the lens and shoot at ISO800? Especially when subject isolation is a positive. Because the availability of fast primes is the most important reason for even having an SLR (or similar). For everything else you can take a good point and shoot and call it a day. Cranking up ISO will not give me shallow depth of field. Hence the "obsession". "Samyang 24 mm F1.4 ED AS UMC has been designed to work with most popular reflex cameras produced by renown manufacturers and equipped with small-image sensors or smaller"
Ouch ! What a question to ask ! And here I am finding f2.8 lenses too slow ! I shoot a bit of weddings and I simply hate using flash so fast lenses are the norm. I have given up mostly on zoom lenses as high ISO performance of modern sensors is good w.r.t. to noise performance but dynamic range, colour fidelity are all compromised. f1.4 allows me to use ISO 400 and below for most shots which is what I want. f2.8 means I have to use ISO 1600 instead all the time. i get canon 24-105mm f4, 70-200mm f2.8, 90-300mm, 28-70mm. think i enout for me. People used fast lenses long before AF became available. Should be just fine! What good is a real fast lens (f/1.4) with a manual focus lens? It's not easy to get manual focus right wide open with such a wide aperture. I would not buy this kind of lens. its super easy to focus on mirrorless cameras as long as the focus ring is smooth. i use a nikon 24/1.4 on a NEX5 all the time, its easy peasy to focus. As far as the optical performance is not designed for AF FX camera, it is too difficult to focus. Cosmetically, the orange colour band of the barrel ring is too urgly, I don't buy it. It should be replaced by a golden colour band like Nikon and Tamron. Samyang has had great success with the 35 and 85mm f1.4 lenses already, so that proves plenty of people are willing to forgo AF for a sharp FF lens with a reasonable price. I like Samyang and the optical quality they provide. For Pentax they provide A lens and it records also Aperture in EXIF - no need to turn aperture ring from lens. So I do not see any difference except manual focusing which is easy with focus confirmation and sometimes with live view. I do not think they are niche player, quite many of us have at least one SAMYANG quite soon. You just do not need 14 mm every day and no zoom lens can provide the quality at wide angle areas. 2) More visual contrast between areas in and out of focus. Sort of agree, but manual aperture and manual focus will surely limit usefullness of that lens in many situations.